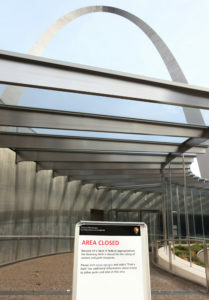 The Gateway Arch in St. Louis is closed during the partial federal government shutdown underway. The 630-foot steel monument is part of the National Park Service, which is among the federal departments disrupted by Capitol Hill’s failure to pass a funding resolution. Some states are using state or local funding to keep popular tourist attractions open for business during the shutdown. Missouri apparently is not. The U.S. Senate is expected to get back to business on Thursday in hopes of reopening affected federal offices, including the major tourist draw in eastern Missouri. Last week, Congress failed to pass a funding bill to keep the government open for business over the holidays and the months to come. President Donald Trump wants $5 billion to build additional wall along the U.S.-Mexico border while Democrats are pursuing more money for border patrol.